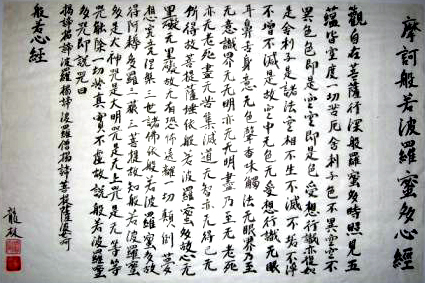 Called the Heart Sutra because it represents the heart of the great wisdom, it was written between the first and the sixth century A.D. Common to all the different forms of budhhism, it is certainly the most well known of the sutras. The bodhisattva Avalokitesvara gives teaching to Sariputra about the emptiness of every being and every object, because none of these posess a fixed or substantial character. Everything is impermanent and exists in interdependence, not in isolation. The sutra is sung after zazen. It is sung in Kanbun, (a phonetic version in an old sanscrit-chinese). understands that the body and the five skandhas (feeling, perception, thought, activity, consciousness) are nothing more than emptiness (ku) and through this understanding he helps all those who suffer. Oh, Sariputra, phenomena are no different to emptiness; emptiness is no different to phenomena. Phenomena return to emptiness; emptiness becomes phenomena. (Form is emptiness, emptiness is form). The five skandhas are also phenomena. Oh, Sariputra, all existence is ku (emptiness). There is no birth, no beginning, no purity, no blemish, no increase, no decrease. Because of this, in ku, there is no form or skandha, no eye, no ear, no nose, no tongue, no body, no consciouness. There is no colour, no sound, no smell, no taste, no touch, no object of thought. no end to decay, no cessation of suffering. can reach the understandiing of this supreme wisdom which frees us from suffering and allows us to find reality. "On, on, together, further than beyond, to the shore of satori."